With a surface area of 155 square kilometers (60 square miles) and saline water with a salt concentration of 300 grams per liter, Russia’s Lake Elton is known as one of the largest and saltiest inland lakes in Europe. 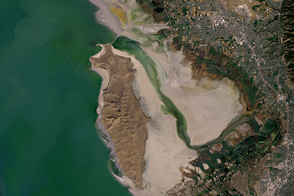 (For comparison, the Great Salt Lake has a salinity of about 200 grams per liter.) As viewed from space, the shallow lake’s circular playa is also notable for being one of the most reflective features in southwestern Russia. 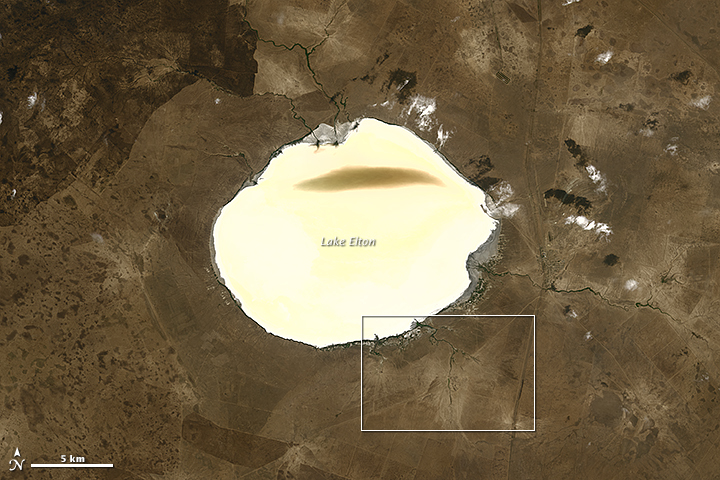 In this natural-color image acquired on August 3, 2014, by Landsat 8, Elton’s salt-encrusted lakebed appears bright ivory and yellow compared to the brown vegetation in the surrounding landscape. 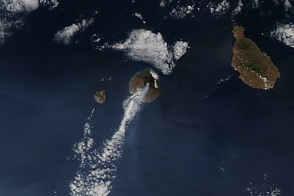 The dark patch in the northern part of the playa is the deepest part of the lake, an area where mud and sediment accumulate and stain the water brown. Several streams and rivers—lined with dark green vegetation—also lead into the lake. In 2012, a team of researchers published an analysis of ten years of daily satellite observations of Lake Elton. They noted that the lake tends to be shallowest and most reflective in late summer and fall, when rain storms are infrequent. As shown by the image, low water levels reduce the amount of sediment in the water and expose salt pan, a light-colored crust of minerals left behind when saline water evaporates. The researchers also found that the lake’s reflectivity—or albedo—changed significantly after 2005. Bright surfaces have high albedos (closer to 1), while dark surfaces have low albedos (closer to 0). The scientists found that Lake Elton’s peak albedo increased from 0.14 in 2004 to 0.40 in 2009, a significant change for such a short period of time. 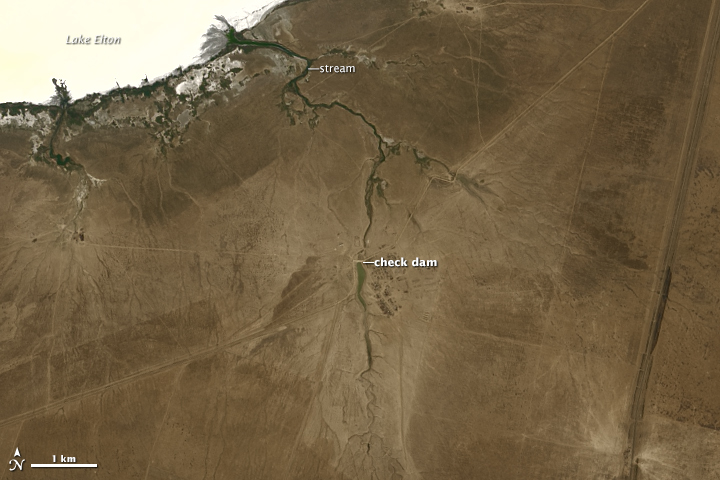 While a decline in rain and snow likely reduced the amount of water and sediment flowing into the lake, the researchers attribute much of the difference to the installation of several check dams around the lake in 2006. After a 2005 flood swamped a medical spa near the lakeshore, the dams were erected to prevent future floods and mudflows. However, the spa relies on the mineral-rich muds to treat skin disorders, and the dams seem to be threatening the existence of the muds by reducing the amount of sediment flowing into the lake, explained Anatoly Zeiliguer, a hydrologist at Moscow State University and one of the authors of the study. “Our study clearly shows that it is most important to understand the hydrological system prior to intervening and drastically altering the dynamics of a fragile system such as a salt lake,” Zeiliguer and his colleagues wrote. 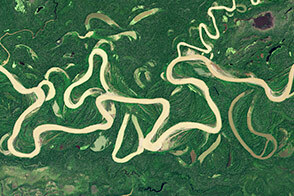 NASA Earth Observatory image by Mike Taylor and Adam Voiland, using Landsat 8 data from the U.S. Geological Survey. Caption by Adam Voiland, with information from Eli Argaman and Anatoly Zeiliguer. 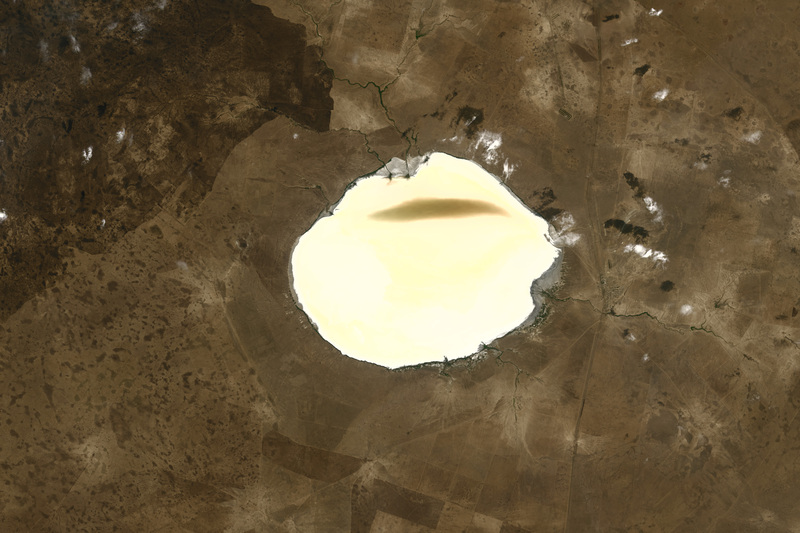 Satellite data suggests this Russian salt lake is getting brighter due to the installation of check dams. 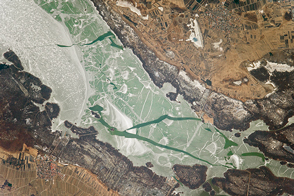 Argaman, E. (2012, April 17) Monitoring the impact of surface albedo on a saline lake in SW Russia. Land Degradation & Development, 23 (4), 298-408. Russian Geographical Society Lake Elton. Accessed November 24, 2014.